The Smartest Thing I Heard in 2016 In July, South Carolina Sen. Tim Scott told me this was an ‘unpollable’ election. He was spot on. Donald Trump is our national obsession. Almost six weeks after the election and on the eve of Christmas and Hanukkah he is topic A at every gathering. People have Post Traumatic Trump Disorder and feel compelled to share their thoughts and feelings, their joy—“I can’t stop feeling happy!” said a normally contained editor and intellectual, to his own surprise—and despair. My world is full of Hillary Clinton supporters and intimates. At a Manhattan Christmas party last week a despairing Democrat told me that she had not only wept on election night she had vomited. She was still beside herself. Soon after Nov. 8 I started asking people where they were on election night, and they’d tell interesting stories of how they heard and when they knew. I noted that people always reported they were with others. On a normal presidential election night some people will be alone at home watching TV, but this year everyone seemed to be with friends and family. My mind went to Carl Jung: Maybe there was something in the collective unconscious of the American people that told them an epochal event was about to occur and they must seek community. I mentioned my theory at a symposium in Washington and an academic called out, “I was alone.” He was traveling for work and was by himself in a hotel room. He was furiously emailing and texting with family and friends, however, so to preserve my theory I told him that no longer counts as alone. But my point is something big has happened, we’re all still absorbing it and it’s going to take time, for many reasons including this: Everyone in politics and journalism knew that if Hillary Clinton were elected things would get boring again. And boring isn’t all bad. The constant electric drama of the election would be over, things would settle down, people would return to their normal state. Now history will never be boring again. It will be a daily drama, for good or ill. By the end we’ll have nerves that jingle-jangle-jingle. I keep going back to the smartest thing a political professional said to me in all of 2016. The most amusing was the spirited remark of a Manhattan social figure who, when I asked in September if he knew who he would vote for, said he would be one of the 40 million people who would deny the day after the election that they voted for Mr. Trump, but had. But the smartest thing came from an elected official, a Republican who, when I asked what he thought would happen in November, got a faraway look. “This is the unpollable election,” he said, last July. People don’t necessarily want to tell you who they’re for. They may not be certain, but they don’t want to be pressed to declare. She turned out to be right. A famous fact of 2016 is that of almost 700 counties throughout the country that voted for Barack Obama twice, a solid third went this year for Trump. Many were Democrats. Very few saw it coming. Near the end of the campaign, Hillary Clinton was leading in most major polls in the swing states. In Wisconsin the week before the election the aggregate of polls at Real Clear Politics showed Mrs. Clinton up more than six points. Mr. Trump carried Wisconsin, by less than a point. In Michigan a week before the election the aggregate had Mrs. Clinton winning by more than three points. Mr. Trump pulled it out by less than a point, close again. On Election Day in Pennsylvania the aggregate had Mrs. Clinton winning by 2%. Mr. Trump won by one. 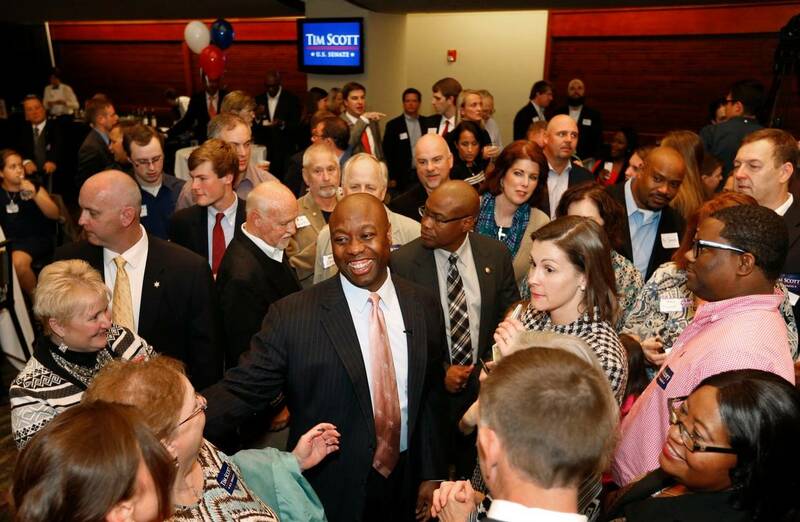 The official who called 2016 the unpollable election was Sen. Tim Scott of South Carolina, the first black man to be elected to the Senate from that state. I asked him this week why he knew the polls wouldn’t get it right. “In the gym they were talking about America socially, and economically.” Those he talked to felt things had been pushed too far to the left. “They know it’s politically incorrect to say it but it ticked them off, and they’re not gonna be speaking to some foreign person on the phone about what they’re gonna do.” He saw this throughout the country. “He’s not gonna be a classic conservative Republican—throw that idea out the window!” Trump will be “more radical in his approach on spending, on job creation. I think he’ll also be more forgiving and thoughtful than people expect.” The party should understand that the Republican base and conservatives on the ground “are more in line with Trump” than with past dogma.